I share Anne of Green Gables’s fascination with places or things that have “scope for imagination” as a key to imagining worlds and stories. There is scope for imagination in the trees outside my apartment window, in long walks in the historic neighborhood next door, and in people-watching on the local bus. A voracious curiosity has led me to travel as much as I can, to fill my head with images and ideas. In 2012, a trip to the south of Spain was the seed that would grow into Fire Dance. I didn’t intend it as a research trip—but the images sank into my imagination, and grew, and suddenly I knew I had a book. 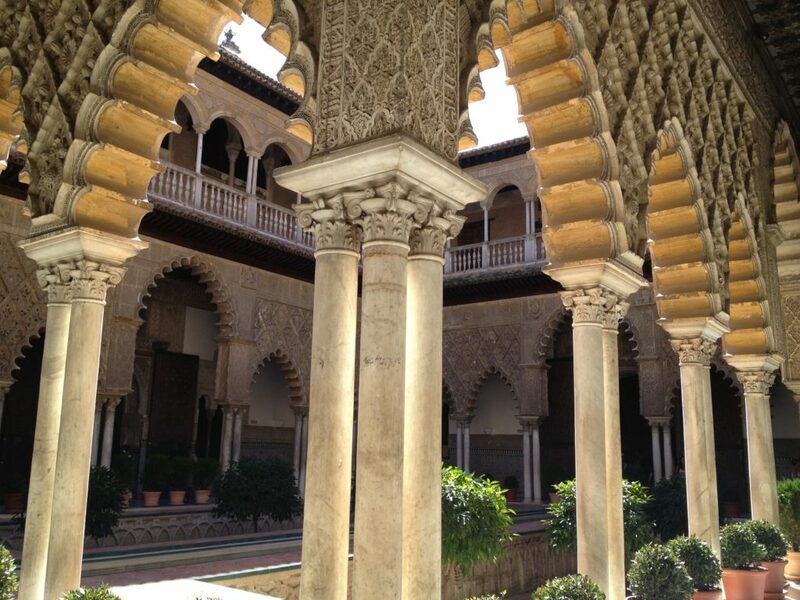 Here is one image from the palace in Seville, which was a source of visual inspiration for the court of the Zahra in Fire Dance. (Other inspirations included gardens in Cordoba, the B’hai gardens in Haifa, and many, many books.) As I envisioned the mystery and intrigue that unfolds in the palace, this image served as a visual touchstone. A courtyard is a liminal space, a point of transition. People pass through them on their way from one part of the palace to another; from one state of being to the next. A spy might leave his bedroom and pass through a courtyard like this, on his way to an assignation with the queen. A Court Poet might pass through, in search of answers to the riddles of the place. The beauty of a courtyard is observed in passing; but it leaves a mark all the same. Once I was consciously working on a book with inspirations from historic Al Andalus, I became targeted in my research. In Paris, I visited the Louvre’s exquisite collection of Islamic art, an exhibition I cannot recommend highly enough. There I found the inspiration for a magical astrolabe in the court of the Zahra, which also made it to the cover art of the book! 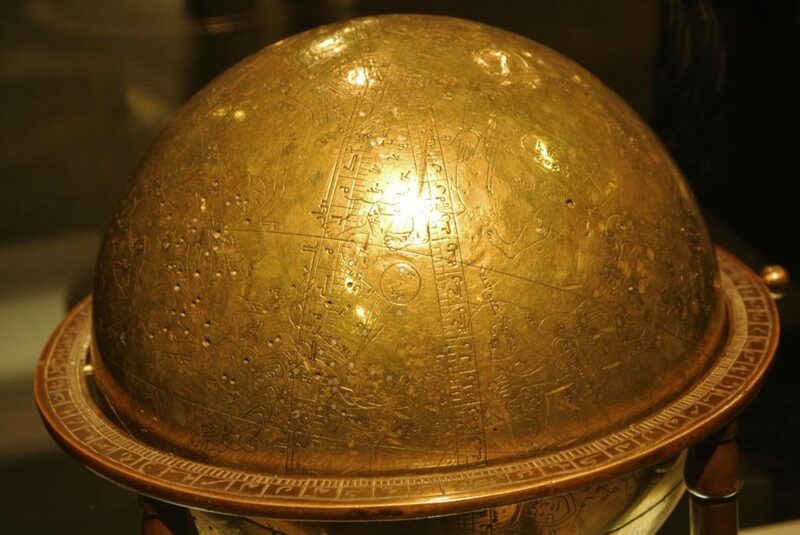 This particular astrolabe is believed the third-oldest in the world. In Last Song Before Night, poetry and enchantments are linked, in a land with imprints of Celtic myth and the troubadours. 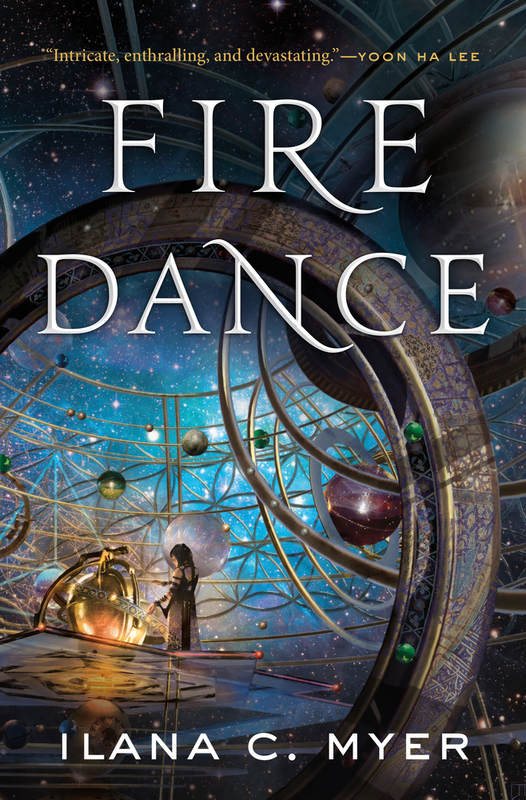 Fire Dance brings the characters to the neighboring land of Kahishi, where royal Magicians read prophecies in the stars in an observatory built by magic. 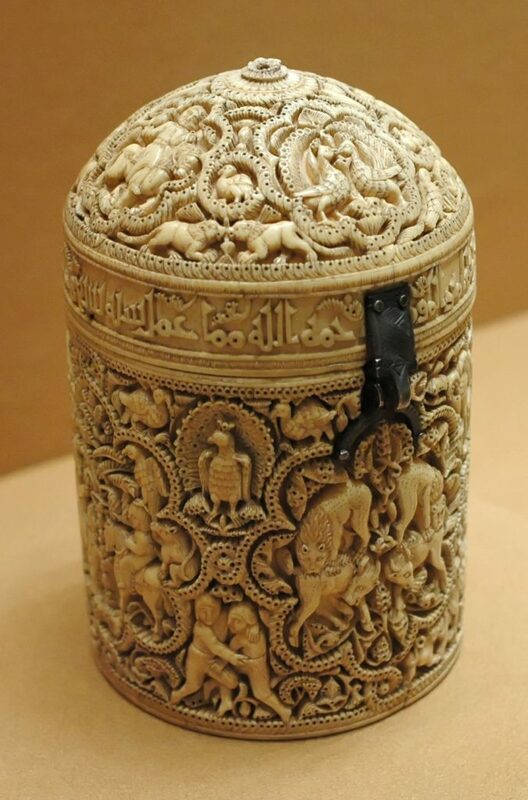 Also in the Louvre collection: magnificent, intricate ivory carvings like this one. They are believed to have contained objects of value like jewelry, perfume, or medicinal substances. They would have housed gifts for royalty, for example. Once, the ivory might have been painted in different colors, or studded with jewels. One can get an idea of what a culture was like, or feel its echoes, in the study of objects like this. Something this small can encompass a world of grandeur, if you think of the infinite care that goes into its making. This was another marked contrast to the original setting of Last Song Before Night, where even royalty was limited in luxury and the scope of its art. The craftsmanship of this casket hints at a magnificence that is nearly limitless; and this thought went into the shaping of the Zahra. It is a place where every aspect of life is beautified, every craft is heightened, as a result of power. An accompanying shadow, there: with power comes the possibility for abuse, for temptation. There is, of course, much more behind-the-scenes of this book, which took three years to research and write. But it would take a book to detail that process. And in the end, just as a theatre director might not want the audience peeking backstage, I think a book is most effective when the author keeps most details of their journey private. Let readers create their own. 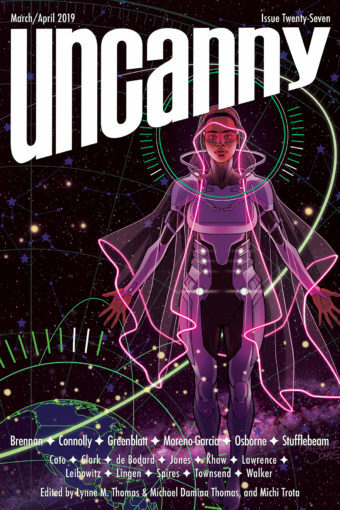 SPACE UNICORNS! 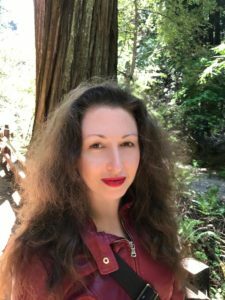 Would you like a chance to receive a signed hardcover copy of Ilana C. Myer’s Fire Dance, courtesy of Ilana and Tor Books? Just leave a comment here (or Tweet with the hashtag #uncannyfiredance) with a link to a favorite poem of yours! (Or no poem if it is too hard to choose one!) You have until 11:59 pm Central on Wednesday, April 18! One of you awesome people will be chosen at random for this phenomenal book! Ilana C. Myer has worked as a journalist in Jerusalem and a cultural critic for various publications. As Ilana Teitelbaum, she has written book reviews and critical essays for The Globe and Mail, the Los Angeles Review of Books, Salon, and the Huffington Post. Last Song Before Night was her first novel, followed by Fire Dance. She lives in New York. I have to go with my favorite: Ozymandias, by Shelley..
One of my others is Adarna by M. Sereno once published on this website. A. E. Housman’s “Terence, This Is Stupid Stuff” especially the last verse. Still go back to this poem every few years.